Tag Archive | "Fresh Market"
Consider the pinecone. While not a viable food source for humans, pinecones are invaluable to birds and mice that eat the tender seeds when other sources of food are scarce. Dried pinecones make great fire starters, with or without candle wax. 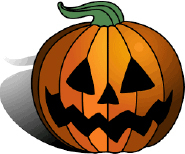 They are a crafters choice for wreaths, picture frames and candle rings. I’ve even seen them used to create charming baskets. A pinecone, a milkweed pod (split in two halves) and an acorn make a rustic angel for your tree. Pinecones added to your greenery create interesting focal points and pinecones are the main base in many winter potpourris. Pinecones open when they are dry and close when they are wet, allowing them to distribute seed at the most opportune time for maximum travel. This phenomenon is the base for an interesting puzzle. While a pinecone is wet (tightly closed), push it into a narrow necked jar and allow it to dry. As it dries, it will open and expand, making it impossible to remove from the jar whole. Ask your kids if they know how you managed to get it into the jar. Pinecone cows were a popular toy back in the day. These were made simply by sticking matchsticks into pinecones for legs. In parts of the world they are still popular. In Finland there is a fairground with statues of pinecone cows for children to play on. Nest a candle in a bowl of pinecones for a charming centerpiece. For an added touch, add a few glass ornaments or a string of dried cranberries. Never leave a candle unattended, as pinecones are extremely flammable. An unopened pinecone is a symbol of virginity. 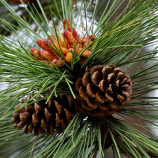 Conversely, pinecones are symbolic with fertility and were often carved into bedposts as an aid to conception. The pinecone is considered a luck charm, favorable influences, protection from harm and sexual power. There are those who believe it promotes healing and inhibits negative influences. Pinecone Firestarters are easy to make and create charming gifts for those who have fireplaces. Gather pinecones and allow them to dry. Collect old candles or crayons for the wax. Melt wax in the top of a double boiler. This is necessary as wax is extremely flammable—do not heat directly on the stove. If you would like to create colored flames, mix sawdust with desired color ingredient (see above). Dip dried pinecones in the melted wax, then dip into sawdust mixture. These can be given in a pretty basket or a recycled onion or orange bag. Add a bit of greenery and a bow, and you have a charming gift for a housewarming or for Christmas. Just be sure the recipient has a fireplace. The Pueblo story of the pine tree as told by the Quères is a detailed (and somewhat disturbing) tale in which a witch is tricked into eating magic pine seeds. The seeds sprout in her belly and turn her into a great pine tree that sways in the wind and moans and sobs forever—as all her pine children do to this day. Anyone who’s ever had a garden—even a small one—knows how much more flavorful fresh produce is. There is something about a fresh picked tomato warmed by the sun that satisfies the senses. The flavor, the texture, the scent—fresh picked produce is simply better all-around. 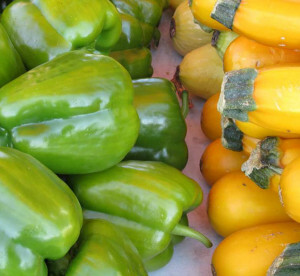 Longer shelf-life; less spoilage; better flavor; more nutrition—all good reasons to try out your local farmers market. Farm fresh eggs—often from free-range hens—provide better nutrition, taste better and are more humane than factory eggs produced by caged hens. Grocery chains do a phenomenal job these days and the focus is more on buying local, but even so, the time between harvested crops to grocery shelves is much greater than what you will find from local (farm) markets. “Local” to a grocery chain usually encompasses the entire state in which the store resides whereas farm markets cater to the surrounding area. Many local markets offer events for the community, providing entertainment as well as educational opportunities—some markets may charge a small fee—others provide these at no charge. Buying local strengthens the community. It provides jobs to farmers and farm laborers as well as local mills and farm supply stores. Locals tend to spend locally, so the money stays in the community working for the community. Farmers markets provide a venue for the community to meet and visit with their friends and neighbors as well as a healthy open-air feel. Prices are often competitive as markets tend to be cheaper for the local farmer and there is no middleman to satisfy. With the relatively new cottage laws, small business start-ups are able to provide fresh home-baked breads, baked goods and jams, as well as a host of other products at low cost because overhead is kept to a minimum. Browse the markets and you can often find a variety of mouthwatering delights, especially in well-established markets where vendor participation is high as competition for Market space boosts creativity. You may even find craft beers and wines at select markets as new laws apply. You’ll find potted perennials and even a few crafts. Or you might just find the following herbed breads. See you at Market! Combine 3 cups flour, yeast, sugar, salt, soda and fresh herbs. Heat liquids until very warm (120ºF.-130ºF.). Add to dry mixture; beat well. Stir in enough more flour to make a stiff batter. Spoon into two 8 1/2 x 4 1/2 inch pans that have been greased and sprinkled with cornmeal. Sprinkle tops with cornmeal. Cover; let rise in warm place for 45 min. Bake at 400ºF. for 25 min. Remove from pans immediately and cool. These are best sliced and toasted and served warm. They’re wonderful with cream cheese, butter, specialty jams or flavored butters. Use your imagination! **I usually use rosemary, as it is a favorite of mine. I’ve also had luck with sage. Basil is another favorite, but use your imagination. The possibilities are endless—you can also combine compatible herbs for a savory loaf. Bon appétit! Native Americans speak of the “Three Sisters,” referring to corn, beans, and squash that were grown together. The following is another legend about the sisters. Long ago there were three sisters who lived together in a field. Each sister was very different from the others, both in looks and temperament. Each had their own interests. They were bound by love for each other and they always stayed together. But a crow came one day and talked to the horses and the other animals. The sisters watched this behavior and, shortly after, the youngest sister disappeared. This left the two remaining sisters very sad. The crow returned to gather reeds at the water’s edge and the sisters watched. That night, the second sister disappeared. This left the eldest sister all alone to grieve. When the crow saw her sadness, he brought the sisters together again and they continue to be together to this day. The eldest stands tall as she always did watching out for the crow. They find strength together and each sustains the other. These three spirit sisters are represented in the crops themselves. Native Americans used this form of “companion planting” for their three major crops, which they believe were gifts from the Creator. The corn provided a pole for the beans, which, in turn, nourished the soil. The squash provided cover to keep the soil moist and to deter weeds. Eaten together, the three crops provided a balanced diet. 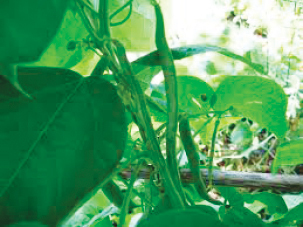 Beans are one of the oldest known cultivated plants, dating back thousands of years. Ancient Egyptians left the beans with their dead to sustain them through their journey and mention was made of beans and chickpeas cast on the threshing floor in the Iliad, written in the late 8th century BCE. According to Wikipedia, the oldest-known domesticated beans in the Americas were found in Guitarrero Cave, an archaeological site in Peru, and dated to around the second millennium BCE. Beans were an important source of protein for Native Americans. They are comparable to meat when it comes to calories. Unlike meat, however, they have a high fiber and water content which helps you to feel fuller faster. Adding beans to your diet will help you cut calories without feeling deprived. One cup of cooked beans provides about 12 grams of fiber, nearly half of the RDA recommended for women and about one-third for men. Fiber means that beans are digested slower, helping stave off hunger longer. In addition, beans are low in sugar, which prevents insulin in the bloodstream from spiking and causing hunger (Beans, Protein-rich Superfoods By Jenny Stamos Kovacs WebMD, the Magazine). Beans are high in antioxidants, which help to control cell damaging free radicals in the body. According to Kovacs, free radicals have been implicated in everything from cancer and aging to neurodegenerative diseases such as Parkinson’s and Alzheimer’s. In a study by the U.S Department of Agriculture of the antioxidant content of over one-hundred common foods, three types of beans made the top four: small red beans, red kidney beans and pinto beans. Nuff said? If you haven’t done so already, do your body a favor and add these powerhouses to your diet. You’ll be glad you did. 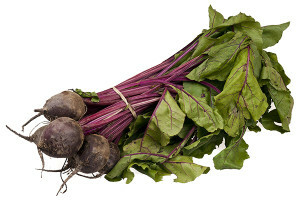 *Dragon’s tongue and Trail of Tears can be found at Solon Market when in season. Please check for availability. Beans in cookies? You bet! Try these for a healthy choice! Heat oven to 350°F. Lightly spray baking sheet with cooking spray. Combine oats, flour, baking powder, baking soda, cinnamon and salt in a bowl. Process beans and 2 tbsp reserved liquid in a blender until smooth. Combine bean puree, butter, sugars, eggs, and vanilla in a separate bowl and beat well. Stir in flour mixture. Stir in chocolate chips. Drop by tablespoons onto baking sheets. Bake 15 to 17 minutes until centers are firm and edges are lightly browned. Transfer to wire rack to cool. Store in an airtight container. Unlike most cookies which are best fresh from the oven, these are better the second day. Best served at room temperature. Ah basil. Its heady aroma, its varied and intense flavors, its striking foliage. How could one not love basil? Its popularity is world-wide, yet none more so than here, with our blend of cultures and cuisines. America’s love affair with basil most likely stems from its association with Italian cuisine, flavorful sauces and pesto. Yet basil was not always loved and it is not native to Italy. Some sources suggest that basil derives its name from the terrifying basilisk—a creature in Greek mythology, half lizard, half dragon, whose stare could cause madness and death. Perhaps this is the source of the belief, first recorded by scribes dating pre-206 BCE that basil “exists only to drive men insane.” It is also the first known written record of basil in any context. Both the Greeks and the Romans associated basil with hatred. Western European lore claims that basil belongs to the devil and for basil to grow well, one must curse the ground it is planted in. The French idiom, “semer le basilica,” to sow the basil, is synonymous with going off on a rant. Nicholas Culpeper believed it was poisonous. He also adhered to the belief that basil could produce scorpions and that smelling too much basil could create a scorpion inside the brain. 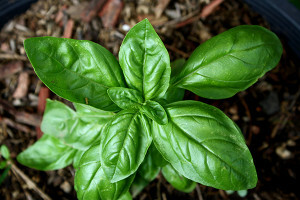 Conversely, basil is held by some to protect against scorpions and the herbalist, John Gerard, noted that those who ate of basil would feel no pain from a scorpion sting. There are as many advocates of basil as there are detractors. Native to India, the word stems from the Greek “basileus” meaning “king.” Jewish folklore suggests that it adds strength while fasting. It is sacred to the god Vishnu in its native country and the goddess of love in Haiti. In Hindu, holy basil, or “Tulsi,” is a symbol of love, fidelity, eternal life, purification and protection. Basil is a member of the mint family. Its essential oils show both antifungal and insect repelling properties and components of the plant have been proven to be toxic to mosquitoes. The herb is an excellent source of Vitamin K and manganese, and a good source of Vitamins A and C. It is heart healthy, being a good source of beta carotene, a powerful antioxidant that protects against free radical damage and also prevents free radicals from oxidizing cholesterol in the bloodstream. Only after it has been oxidized does cholesterol build up in blood vessel walls. Because free radical damage is a contributing factor in other conditions, such as asthma, osteoarthritis and rheumatoid arthritis, basil may help to lessen the progression of these conditions as well. Studies have shown that components of the oil can act as an anti-inflammatory by inhibiting an enzyme called “cyclooxygenase.” Many common over the counter non-steroid anti-inflammatory medications, including aspirin, ibuprofen and acetaminophen work by inhibiting this same enzyme. Basil is best consumed fresh, as drying changes the flavor. For cooked dishes, add this herb at the end of the heating process to maintain flavor and nutrition. For future use, try freezing basil in ice cube trays with water for soups and sauces. Or try our recipe for pesto below. In a food processor, pulse basil, garlic and pine nuts briefly—do not over process. Add cheese and pulse a bit more. Blend in olive oil and add salt to taste. Great on sandwiches or over pasta. Refrigerate. It is January. In an old shed near Wakefield England, a group of men move carefully among the rows of rhubarb, plucking the pink stems by candlelight. Most of the shed is in darkness and the atmosphere is hushed. There is an air of reverence here, as if some rude cathedral. If one listens quietly, states the farmer, Janet Oldroyd-Hume, one can hear the rhubarb grow. Is this some sacred rite from pagan days gone by—some obscure celebration of the solstice? No. It is the harvest of the forced winter crop, cast in darkness to encourage rapid growth. Oldroyd-Hume relates the tale that led to this remarkable scene. In 1817 or thereabouts, the legend goes, workers digging a trench in Chelsea inadvertently covered some rhubarb roots with soil. Upon removing the soil, they discovered that the rhubarb, seeking daylight, had grown long pink stems. “Luckily, it was Chelsea,” Oldroyd-Hume quips, “so they tasted them.” Ian Jack-the Guardian, January 2008. Welcome to the Rhubarb Triangle—a 9 square mile area between Rothwell, Morley and Wakefield famous for its forced rhubarb. Most rhubarb, as is Michigan’s crop, is grown naturally and harvested in the early to late Spring. The bright red stalks, native to China and dating back over 5,000 years, add a festive look to pies and jams and its tart distinctive flavor makes it an excellent choice for sugared desserts. Rhubarb was given the sobriquet, “pie plant” as it is a vegetable, but is treated as a fruit. Before sugar’s introduction to the world, rhubarb was treated primarily as a medicinal plant—its roots are a powerful laxative that is still used today. As sugar became more available and popular to Europeans, so too did rhubarb. The vegetable lost favor during wartime sugar shortages—people grew tired of eating the plant with little or no sugar and so turned to other more costly fruits to round out their diets. It’s been reported that, for a brief time during WWI*, it was advised to use rhubarb greens as a food source in Briton—this was quickly rescinded as it became abundantly clear that the leaves are toxic to both humans and animals. 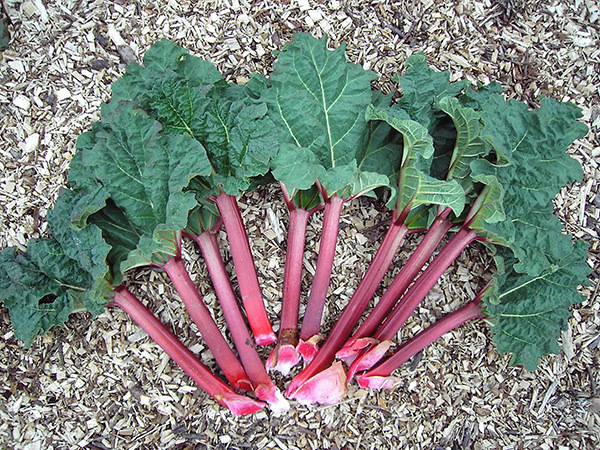 Ben Franklin was said to be responsible for the introduction of rhubarb to North America in 1772. And Marco Polo wrote extensively about this medicinal herb. In the late 1800’s, Russians brought the stalks to Alaska to treat scurvy as the plant is rich in vitamin C. Rhubarb is low in calories and high in fiber, making it a highly desirable plant for our diet as is. However, few of us can tolerate the bitter stems without a touch of sugar. *Note: Although many sources state WWI, others state WWII. I even found a reference to Americans being advised to eat the leaves as opposed to the British. One of the sources that I would have trusted most contradicted itself within the same article. Combine—spoon mixture into 8×8-inch pan. Bake at 375º 40 minutes. This is delicious warm from the oven, but can be reheated or eaten cold. 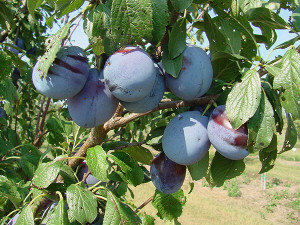 It is commonly held that there are only three fruits native to North America—blueberries, cranberries and Concord grapes. While I am not certain of the accuracy of this statement, cranberries are indeed native to America. Native American Indians used the berry as both a food source and a wound medicine, as well as a dye. 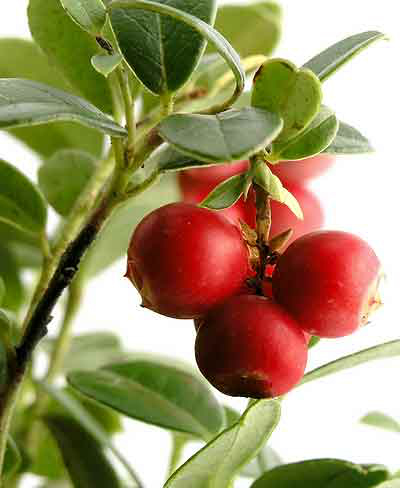 Its name is said to come from a variation of “craneberry,” so called because the early settlers from Europe thought the flower resembled the head of a crane. Also referred to in various parts of the world as mossberry, fenwort or fenberry, marshwort, bearberry, bounceberry (a common method of testing for quality was to bounce them) and Sassamanash. The rich red color of the berries lends itself well to festive occasions such as Christmas and Thanksgiving. Indeed, many of us associate the fruit solely with Thanksgiving and have not enjoyed the many dishes that can be created from this versatile berry. If your experience with cranberries has been limited to cranberry relish, it’s time to open the door to a world of culinary possibilities. Cranberries—used to flavor meats for centuries—make a good addition to breads and desserts as well as salads and cereals. 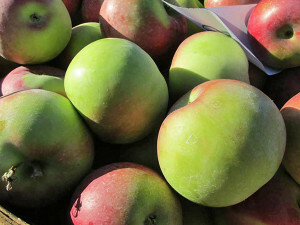 Because of their tart flavor they are best consumed in a sugared dish or paired with another fruit such as the apple. Cranberries are one of the Super Fruits. This nutrient rich berry carries its own natural anti-biotic and has been linked—in the form of juice—with urinary tract infections relief in women. Cranberry juice consumption can aid in the prevention of tooth decay as it helps prevent the build-up of plaque. Studies indicate that extracts may have anti-aging effects. Cranberries are high in vitamins C and K as well as fiber. Vitamin K promotes cardiovascular health. It, along with phosphorous in cranberries assists in bone and tooth health. An Indian legend describes how the cranberry came to be: Long ago, the Yakwawi’àk, or Mastodons, walked the Earth, placed here by the creator to be useful to man. The monstrous beast was fierce, powerful and invincible and a great help to the Lenape’wàk . But the powerful creatures turned on them and waged war on all of the animals—a great battle was fought. Many lives were lost and the ground ran red with the blood spilled. Yet the Yakwawi’àk were nearly impossible to kill! Slowly, the battlefield turned into a great quagmire and many of the hugh creatures drown. The Creator, angry with the monstrous beasts, threw lightning bolts, killing all but one bull. Badly wounded, the beast fled to the far north, where it is said, its evil spirit remains. Evidence of the great battle can be seen today. You can find the bones of the Yakwawi’àk as well as other animals in the marshes. The Lenape’wàk were saddened by the lives lost and the loss of potential food and furs. In remembrance and compassion, the Creator caused the cranberry to grow in the marshland so that it might be used as food for mankind. The deep red color of the berry was to remind us of the blood that was spilled on that terrible day. In a large bowl, cream butter and sugar until light and fluffy; beat in milk. Combine the flour, baking powder and salt; gradually add to creamed mixture. Stir in cranberries. Pour into a greased 9-in. square baking pan. Bake at 350º for 40-45 minutes or until a toothpick inserted near the center comes out clean. Cool on a wire rack. In a saucepan, combine melted butter, sugar and cream; bring to a boil, stirring often. Boil for 8-10 minutes or until slightly thickened. Remove from the heat; stir in vanilla. Serve warm over Cranberry Cake. Everyone knows that babies come from the cabbage patch, right? But do you know where cabbages come from? According to Roman mythology cabbages sprung from the tears of Lycurgus, King of the Edonians of Thrake. Lycurgus had reason to cry cabbage tears, having angered the god Dionysos whom he had persecuted. As punishment he was struck mad and in this sad state, slew his wife and sons. Cabbage is one of the earliest domestic vegetables, likely dating as far back as 1000 B.C. They are from the family Cruciferae, from the Latin for “cross”, so named because the flowers of this family are cross-shaped. While many varieties of cabbage can be found today, the most common and familiar to us are the green and red cabbages. The savoy cabbage, also fairly common, was developed by German gardeners during the 16th century. Not all cabbages are equal as red and green and savoy all have slightly different nutritional values. For a nutritional powerhouse, you can’t go wrong with cabbage! Generally speaking, one cup of raw, shredded cabbage contains only 50 calories and a whopping 190% of the RDA of vitamin C. It is an excellent source of vitamin K with 91% RDA in one cup, shredded. It is also an exceptional source of manganese, vitamin B6 and folate as well as a good source of thiamin, riboflavin calcium, potassium, vitamin A, fiber, protein and magnesium. With virtually no fat, it is a dieter’s dream! Cabbage, in the form of sauerkraut, was used by Dutch sailors to prevent scurvy during long ocean voyages. Captain Cook believed in the medicinal value of sauerkraut and his ship’s doctor used it for compresses for wounded sailors. Long before this the cabbage was recognized as a valuable medicinal tool—Greeks and Romans believed that the vegetable could cure almost any illness. Both the Egyptians and the Romans believed eating cabbage before a night of drinking would prevent them from feeling the effects of the alcohol. 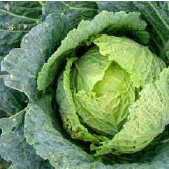 While I found no support for this theory, cabbage juice has been used to treat stomach ulcers and to relieve constipation and cabbage has been linked to cancer and stroke prevention. Love of cabbage was the undoing of the Man in the Moon, whom, it is said was banished to Earth’s satellite because he had been caught stealing a cabbage from his neighbor on Christmas Eve. The heaviest cabbage on record was grown by Scott Robb of Palmer, Alaska and weighed 138.25 pounds. The largest cabbage dish used 80,191 cabbage rolls and weighed 1,221 pounds. Babe Ruth wore a cabbage leaf under his hat during games to keep cool—he would change it for a fresh leaf every 2 innings. World Cabbage Day is on February 17th. You can use red cabbage water to determine pH—it will turn red in acidic solutions and green in basic solutions. In a neutral solution it will stay purple. You can make red cabbage water by chopping up one large red cabbage and boiling it until the water turns a deep purple. Cool and refrigerate. Cut the cabbage thinly as for coleslaw—discard core. In a large pan, sauté in butter until tender and slightly browned—approximately 10 to 12 minutes. Add seasons and serve as a side.